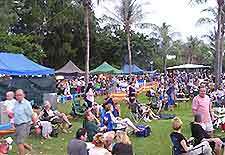 Many well-supported festivals take place within the Northern Territory on an annual basis, often being centred around Darwin. Each year on the first day of July, Territory Day is a huge event, with the local government laying on an evening fireworks display at Mindil Beach. The month of July also sees the arrival of the rather unique Darwin Beer Can Regatta, which was first held in 1974 as a way of recycling rubbish following Cyclone Tracy and now sees participants creating boats out of little more than cans and plastic bottles. The regatta features boat races alongside Mindil Beach, while those who prefer dry land can join in the various other related events, such as tug of war competitions, sandcastle building and beach races. Lasting for two weeks and staged each year in the middle of August is the aptly named Darwin Festival, where things to do and see include live music, film screenings, comedy gigs and exhibitions of Aboriginal art, as well as the NT Indigenous Music Awards. Also staged in August is the Rodeo, the Darwin Cup horse race and even a Mud Crab Tying Competition.